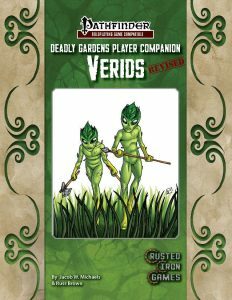 Verids are, as you may have surmised, a new plat-race intended for use as PCs – originally of extraterrestrial origin, they have several unique spins on the established tropes: Beyond looking a bit like plant-like versions of gray men, they seem to have a grudging respect for dwarves (!!!) for their mining prowess, but consider other races to be deviations from the natural order. While personally, I like this spin on the tropes and a GM could rationalize it by them having a somewhat odd or skewed perspective on “natural order”, the fact remains that dwarves, in most campaigns tend to hearken closer to the tropes of scions of civilization and industry, so that may be something to look out for.